This summer we invite future beauty professionals an opportunity to learn more about beauty care and the beauty industry in a fun filled week. Each day from 9-4 students will be immersed in beauty school education, hands on activities and fun learning. Campers will learn beauty tricks, hair care , nail technical skills, and skin care. 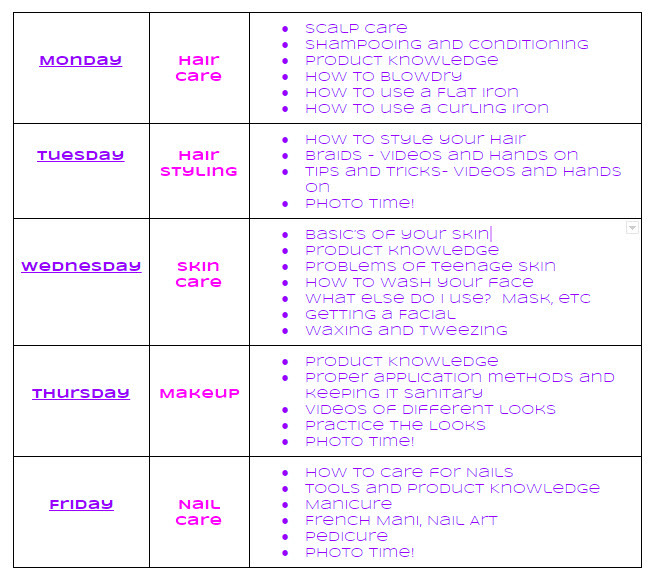 Both weeks will consist of young ladies, ages 12-17 years old participating in skin department, Nails & Hair. In skin, they will learn how to properly maintain and care for their skin. They will receive facials and will learn how to apply age appropriate make up. Each camper will receive a small skin kit care kit of products and supplies. Nails- they will learn proper nail care and will receive mani's and Pedi's and fun nail art. Each Camper will receive a small nail kit of products and supplies. In hair- we will have 3-4 braids pre planned to teach them and also how to use curling and flat iron correctly. and also hair maintenance Each camper will receive a small hair care kit of products and supplies. We will provide light snacks and lunch.